Crossroads in Biology (CiB) is a recurring international symposium covering diverse areas of life science research. 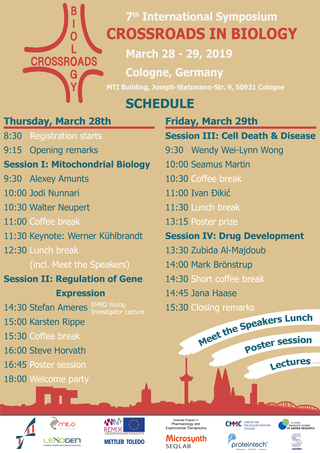 The conference is organized by PhD students of the Graduate School of Biological Sciences (University of Cologne) and will take place March 28 – 29, 2019 in Cologne. We thank over 250 participants for registering to CiB2019 and are looking forward to an amazing symposium! Up for the best scientific symposium of your life? ??? ?